What fits on the Desk Riser? Still thinking about The House of Trade Desk Riser? 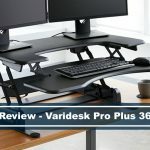 Either you are looking to buy a new standing desk, or you just learned about all the health benefits of standing and are ready to switch to a healthier lifestyle, the real challenge is in choosing the best one that fits your needs and price range. It is easy to get lost in the sea of options, only to regret the decision in the end. 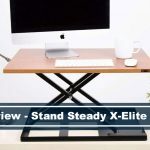 The House of Trade Standing Desk Riser is one of the best-selling standing desks that you can find online today. It was rated four stars by people who purchased it, but how well does it stack up against its competitors? 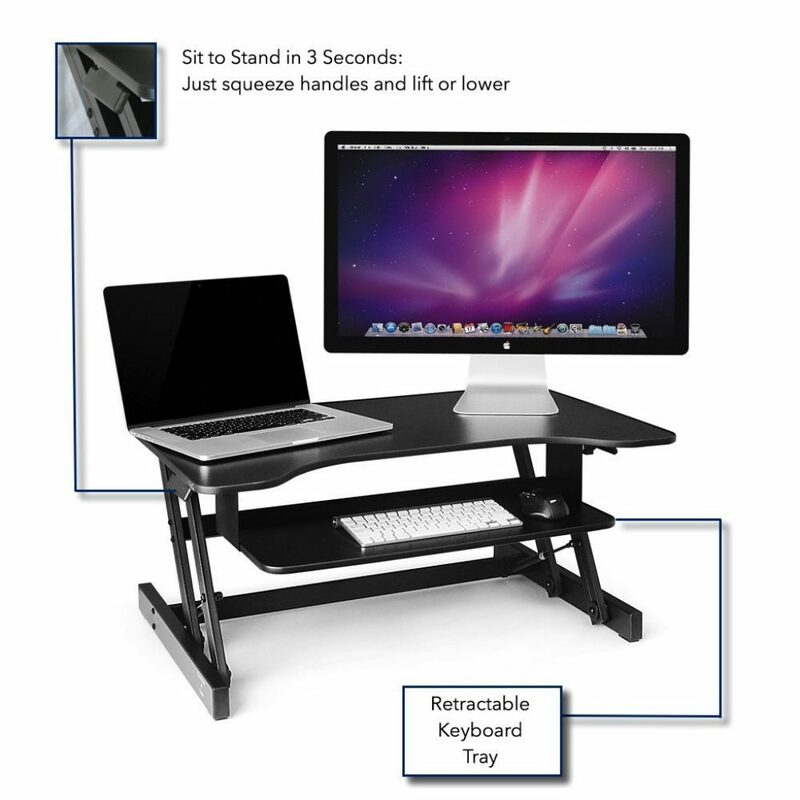 Review summary Two-tiered stand up desk converter with a sliding keyboard, big enough for dual 24″ monitors, or a 27″ monitor and a laptop. 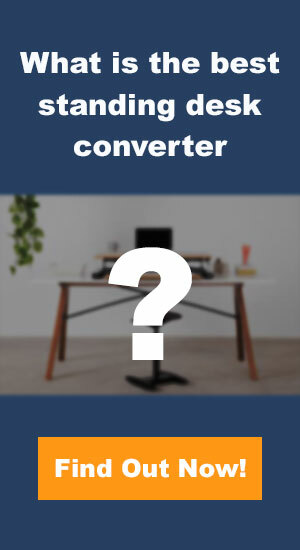 The House of Trade stand up desk converter has five different height adjustments (and comes up towards you), using dual handles and air pistons for easier lifting support. Dimensions Surface: 31.9″ W x 20.5″ D.
Warranty Limited 1 year warranty. Will replace for free free within 1 year of purchase date, if defective. Warranty only covers the mechanics of the product (it doesn’t cover any scratches, blemishes, or other wear and tear that occurs during normal usage of the DeskRiser). 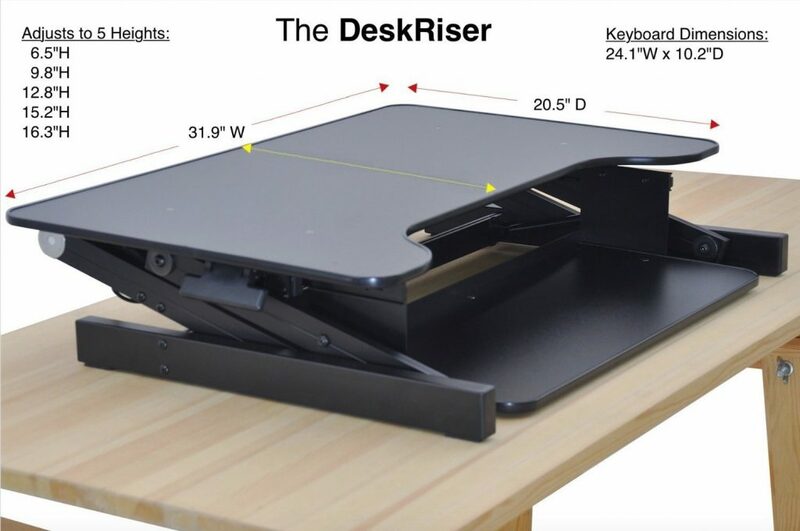 Like all standing desks converters, the Desk Riser is created to help people achieve a healthier lifestyle by reducing the risk of developing immediate and long-term health issues such as cardiovascular diseases, high-cholesterol, obesity, high sugar levels, and chronic back pains. According to research, it can even help decrease the chances of getting a particular type of cancer and diabetes. It can also contribute to improving your mood by enhancing the body’s energy levels resulting in increased focus and productivity. You can use Desk Riser straight out of the box. We just love ready to use standing desks. There are just so many ways you can mess up something that needs to be put together before you could use it. Just place the desk on top of your existing desk and adjust the height according to your comfort level and you are good to go. A wide work surface is great especially if you need ample space for your monitors and other stuff. This desk’s work surface can accommodate multiple monitors or two 24 inches wide monitors and a little extra space to spare for pens, notebooks, etc. This desk comes with a sliding keyboard tray, which is already a plus. However, most people find it too small. This is disappointing if you prefer a standard size keyboard and ample space for mouse movement. If you follow a sit-stand routine at work to ease your back, neck and leg strain, you won’t have to stop work to stretch or move around. The squeeze handles on each side makes it easy to raise and lower the desk in just a matter of seconds. The hydraulic levers on the side are well-positioned, but some users find it difficult to lift and raise the desk when it is lowered, especially when monitors are on top of it. This could be a problem for elderly or those with bad backs. Overall, this is a high-quality desk that is built to last. It also comes in black and white in case you want options. The weight capacity of the desk matters. It somehow determines if the desk would remain stable with all your equipment and desktop on top of it. Naturally, if you place items more than the desk could handle, it would wobble when you put pressure on it. The Desk Riser has a weight capacity of 50 lbs. You will not have to worry about your monitors falling or the desk crashing especially if you have heavy monitors and other desktop items. There are five height levels to choose from, and it ranges from 6.5 to 16.5 inches, which works for people with heights ranging from 5ft to 6ft tall. However, the height is an issue for most users. The desk stands at awkward height levels that some find it hard to set the right ergonomic height. A great video by House of Trade, showcasing their use case for their Desk Riser model. While not without minor caveats, this desk is still highly recommended. 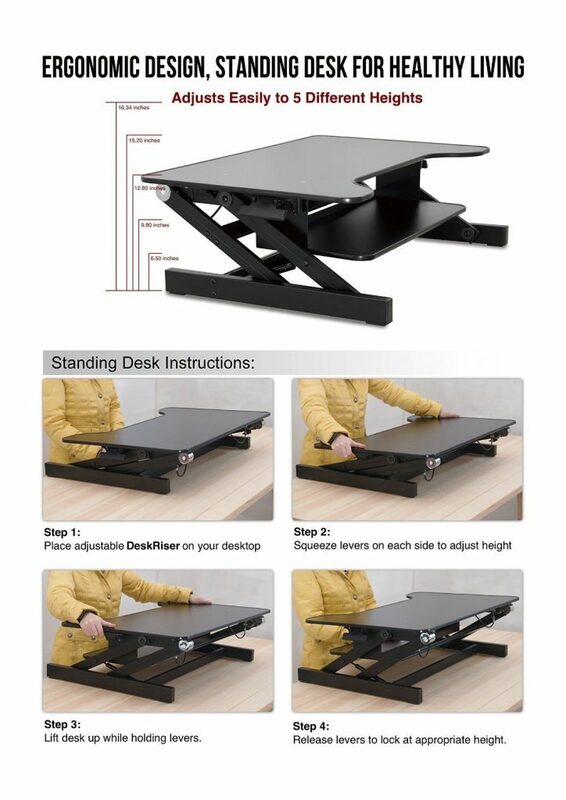 If you decide to buy this desk, it is best to test the physical product first to check if the height level is not going to be a problem for you. The sliding keyboard is just a minor issue and workable. Overall, the desk is sturdy, functional, and cheaper than other standing desk converters. However, if you are an elderly user or someone with a bad back, and you work alone most of the time, you might be better off buying one that is easier to lift to prevent any injuries. More affordable than its rivals. The sliding keyboard tray is a little bit too small. Difficult to raise the desk when it is fully lowered with all your monitors and desktop items on top of it. Some users complain about the awkward height levels of this desk. It is easy to adjust but finding the right ergonomic height is a struggle.